Everything is normal at Bow's favourite bus stop bypass. Buses stop. Passengers embark and alight. Cyclists whizz by. But there is a problem - the interface between pavement and bus stop is indistinct. What the designers of the bus stop bypass hoped was that pedestrians would cross to and from the pavement via a short raised section. Those requiring level access do, else their pushchairs, wheelchairs or whatever would get stuck. But other pedestrians generally cross wherever they like, stepping across the blue channel either with or without looking, creating inevitable conflict. 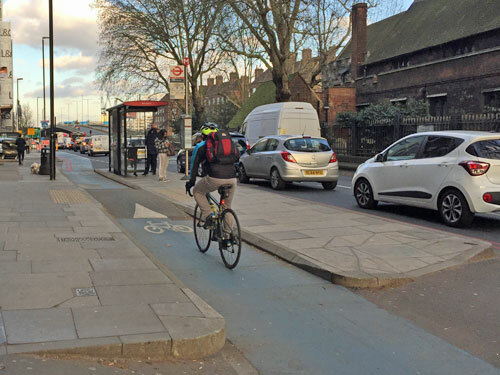 What the designers of the bus stop bypass also hoped was that cyclists would slow down when they passed through, taking care in case pedestrians were trying to cross. Some do, some are forced to slow down because oblivious pedestrians are standing in the blue lane, and some speed through anyway ringing their bell to clear the path ahead. Here come the contractors. 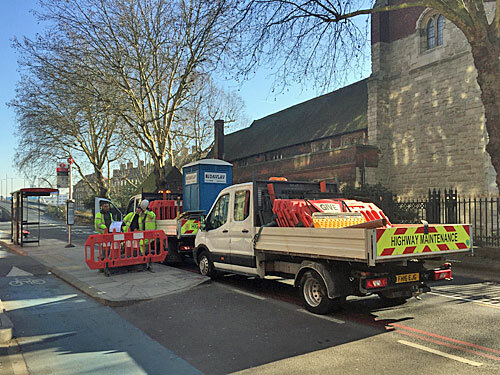 They have two truckfuls of equipment, including cones, signs, barriers and a portaloo. It's half past ten in the morning and they're just about to shut Bus Stop M down. A ring of orange plastic will surround the shelter, the cycleway and adjacent pavement. Cones will seal off one of the lanes of traffic so that everyone heading towards the Bow Interchange is funnelled into single file. 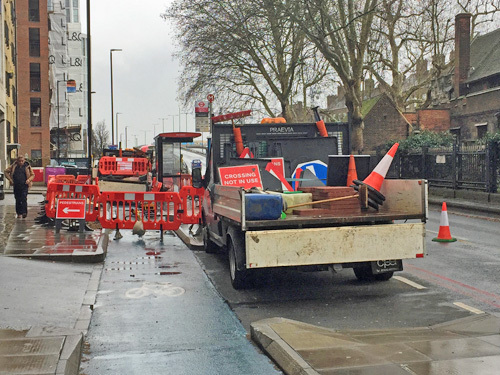 Cyclists will be informed that the cycle lane ahead is closed, and left to decide whether to join the traffic or to ride up on the pavement. The blue Davlav will take pride of place beside the kerb. The zebra-fication of Bus Stop M's bus stop bypass is about to begin. Here's the view from the top of a passing bus. Bus Stop M is longer than your average bus stop because it's split into two parts with a driveway through the middle. All the action is taking place on the front half at the moment, but eventually the rear half will need the same treatment because that's a separate island. While the bus stop is coned off buses are temporarily unable to stop. This is not popular. A woman waiting by the kerb waves at our driver to try to get him to stop, but he is well trained and will not do so. She continues to wave, more angrily now, because the bus is stuck in a queue of traffic immediately alongside. Eventually she gives up and strides off towards the next bus stop, five minutes walk beyond the roundabout. This is also where passengers trapped unexpectedly aboard the bus are heading, because the iBus system thinks the stop is open and no announcement was made in advance. Other drivers take a different approach. A 425 driver stops just before the closed bus stop to let passengers off. A 276 driver stops just afterwards. A 108 driver opens the doors alongside the rear set of cones while the traffic isn't moving. But most drivers do the right thing and pass by, to the temporary annoyance of all. The temporary cover over the top of Bus Stop M reads "Bus stop closed during dates and times described below". A yellow poster amid the timetables does indeed have this information, but none of the detail can be read because the bus stop is closed and barriered off. The poster confirms that Bus Stop M is closed each day from Tuesday 26th February to Tuesday 5th March between 8am and 4pm, but you'd only know this if you'd visited the stop while it was open. The advice you can't read says "Passengers are advised to board their buses at the next bus stop". This is very poor advice on route 488 because the next bus stop is the last one. It's not particularly helpful advice on route 8 because the next bus stop is one kilometre's hike away, up near Roman Road. On the other four routes much better advice would have been to board your bus at the previous stop, because that's a much shorter walk. Alas there isn't a previous stop on route 8 because this is the first stop, and basically if you want route 8 you're stuffed. This is not a good week to be trying to use Bus Stop M.
Weather's turned. The contractors are back for their third day, parking up in the middle of the bus stop bypass and returning to their work. These guys are experts in paving, because most of what needs doing is updating and/or replacing slabs and kerb. One job being undertaken is making the crossing point a little wider. Another job is to replace the bumpy yellow blocks with bumpy red blocks, to better aid the visually impaired. Another job is to ensure there are more red blocks than there were yellow blocks, to make the route from pavement to bus stop more distinct. And a consequence of this is a lot of grinding, bashing, scraping and re-laying, with spirit levels poised, so that the end result can endure for many years. The yellow blocks only managed three. 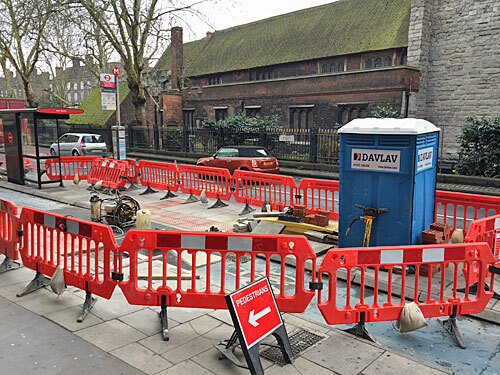 I should point out that the bus stop is only in full-on roadworks mode for a few hours a day. 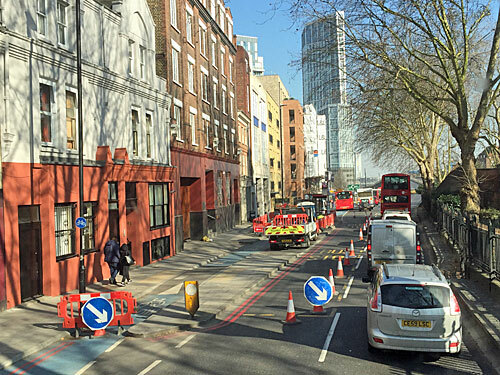 At the end of the afternoon the workmen remove their cones so that traffic can again flow past using two lanes rather than one. They also shift their barriers and shrink their corral so that the bus stop can be returned to operation. By restricting work to the hours between the morning and evening peak, congestion and inconvenience are being kept to a minimum. That portaloo isn't ideal, though, especially if the bus draws up and opens its middle doors immediately adjacent. It's amazing how long tweaking a few slabs and kerbs takes. Here we see the new red blocks snaking off towards the roadside, plus a slight hole where additional red blocks need to be added. The workmen have a special grindy pumpy contraption which they fill with liquid from a plastic canister before attacking another section of edge. They have shovels, pickaxes and tape measures, as well as more modern bits of equipment. They have sand for brushing over the newly-laid tactile blocks to infill all the gaps. They have snacks and lunch, which they retreat to their trucks' cabs to eat when the time is right. They do not appear to have lengthened the hump, but they have extended access to it. Alas work on the front half of the bus stop bypass wasn't quite completed before the weekend kicked in, with one final bit of kerb not yet in place. A mysterious tarmac slope has been added, and covered with temporary yellow plastic, for reasons which may become more apparent next week. That means there are currently two humps rather than one, so it's a bit like negotiating part of a mountain biking course, but cyclists can again whizz through and pedestrians can reach their buses. No work has started on the second island yet, so that'll be next week's task, and everything had better be finished by Tuesday evening because that's when possession ends. 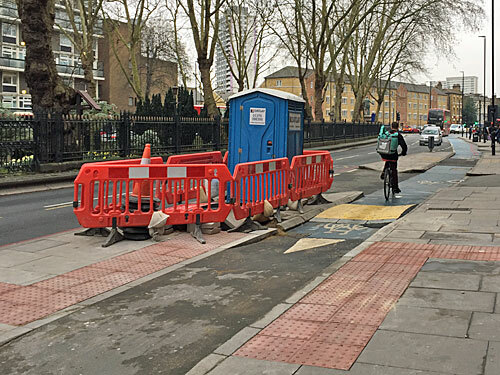 Here's what the finished product ought to look like, because similar work has already taken place at every other bus stop bypass along Bow Road. Where previously there was a featureless hump there's now a painted mini-zebra-crossing, showing pedestrians where they ought to cross and hinting to cyclists that they might need to give way. 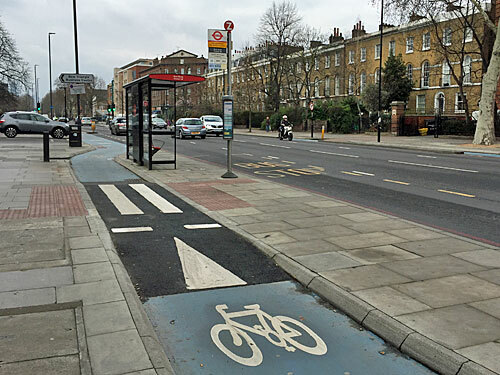 It's such a simple idea it's amazing it wasn't implemented when the segregated Cycle Superhighway was first built in 2015, but hindsight is a marvellous thing. 43 bus stop bypasses are being retrofitted in this way, and Bus Stop M is one of the last. The entire project is due to be completed by the end of the month, increasing visibility and reducing risk for all, fingers crossed.